Gemini DJ, a division of GCI Technologies, has recently announced the launch of two new DJ Control Surfaces for PC. The long-awaited Gemini CTRL USB DJ controllers were unveiled in the US over the summer and are powerful tools for use with a PC and DJ software. Gemini adds more fuel to the “laptop revolution” by giving DJs affordable and familiar interfaces, complete with their favourite playback, mixer, and song-shaping tools, and offering the traditional feel of ‘two decks and a mixer’ in a portable format. Two units are to be released simultaneously: the CTRL-ONE being the basic unit, and the CTRL-SIX, which adds an audio interface that takes over the sound processing functions from the user’s PC or laptop. Both units have 46 buttons, 5 faders, and 18 rotary knobs for complete control over a DJ’s music, and have brightly illuminated buttons and LED meters for easy viewing in any environment. 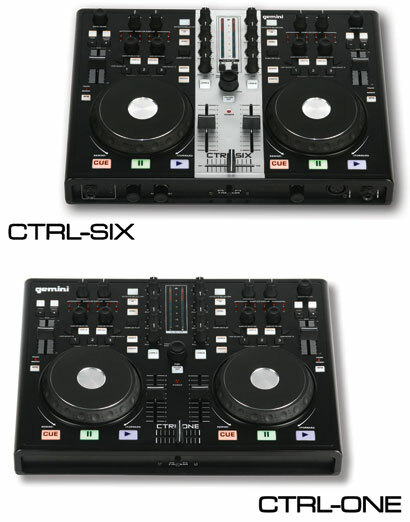 The CTRL-SIX features two individual mixing channels; two large touch-sensitive jog wheels for scratching, cueing, and other assignable parameters; a cross-fader with adjustable X/Y slope; and adjustable channel faders. It has an input/output section with a traditional-style mixer, two channels of switchable line/phono inputs; a 1/4” mic input; XLR outputs; RCA outputs for Rec / Master / Booth; and 1/4” and 1/8” headphone jacks. The hardware soundcard in the CTRL-SIX offers multiple input and output options that a regular laptop would not. The new CTRL-ONE has the same basic functionality, minus the soundcard and input/output jacks, and lets the DJ’s PC handle the audio processing while allowing all of the same control over music manipulation as the CTRL-SIX. A version of the popular Virtual DJ software is included with both units. Virtual DJ is AUDIO and VIDEO mixing software, targeted at all levels of DJ. With Virtual DJ's breakthrough BeatLock engine, songs will always stay in beat, which lets DJs work their mixes faster than ever before. The automatic seamless loop engine and synchronised sampler also allow DJs to perform astounding remixes live, with no preparation at all. The visual representation and the cues allow a DJ to clearly see the song structure, and never be surprised by a break. “Gemini has been the leader in DJ equipment breakthroughs for many years, and now we have new solutions for laptop DJs of all levels, and at very affordable prices”, said Alan Cabasso, President of GCI Technologies.